Galileo was launched in 1989 and plunged into Jupiter’s crushing atmosphere on September of 2003 to protect the possible ocean on the moon Europa. Mars Global Surveyor photographed Mars from 1997 through 2006. 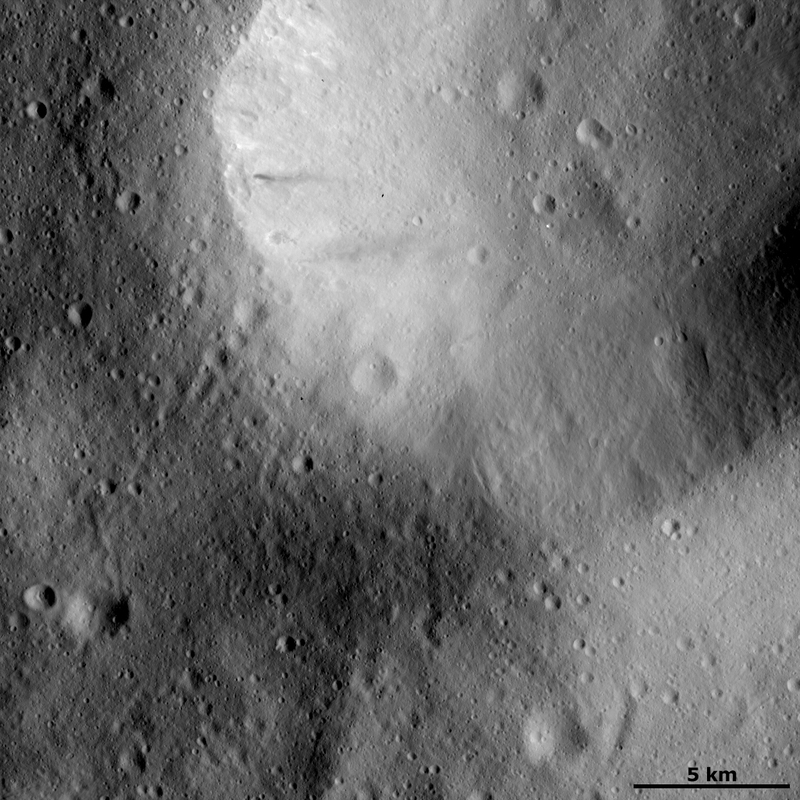 MESSENGER was launched in 2004 and arrived in orbit around Mercury in March 0f 2011 after three flybys. The Cassini-Huygens Mission to Saturn arrived in 2004 to Study Saturn and the moon Titan. Exploration continues. 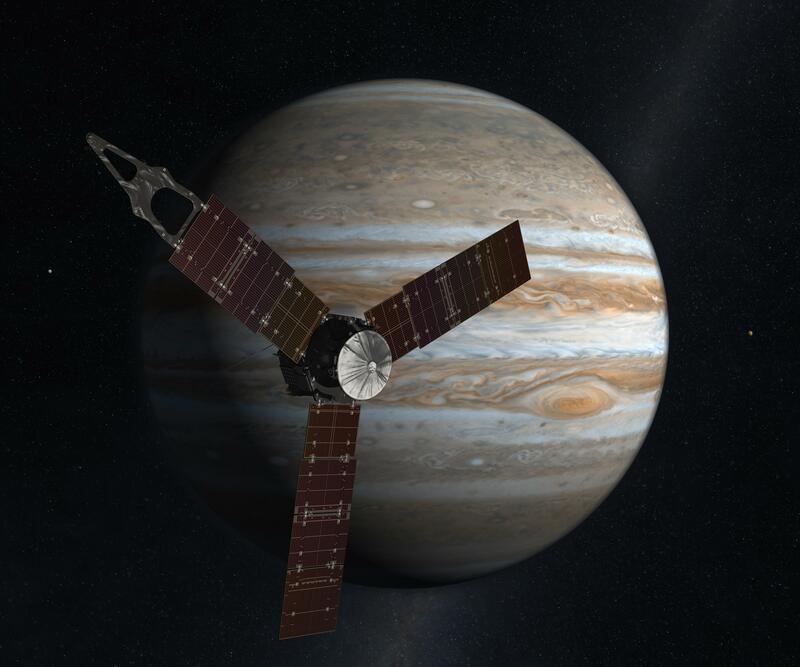 The Juno Spacecraft was launched toward Jupiter on 5 August 2011, and made its first planned trajectory adjustment Wednesday. Over the course of the next five years, a dozen additional corrections are expected before arriving at Jupiter for a year long exploration. The thrusters fired for 25 minutes and changed the speed by 1.2 meters per second. In August of 2012, Juno will make the first of two adjustments prior to a flyby of Earth for a gravity assist. For additional information, consult the Juno website. 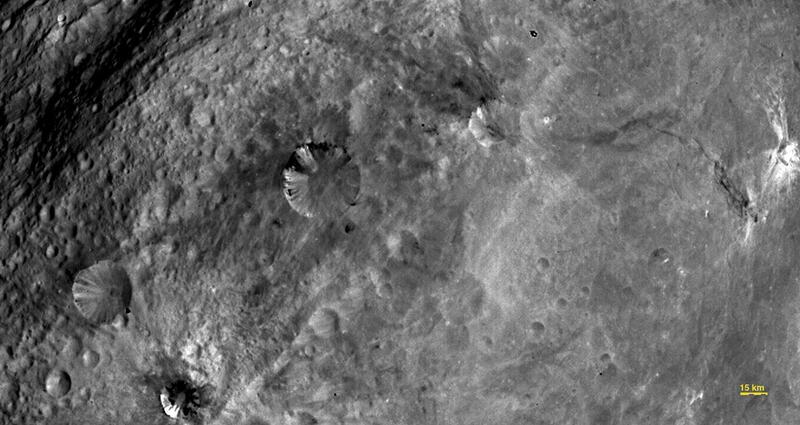 The Dawn spacecraft has completed imaging of Vesta from an altitude of 5,200 kilometers and has begun spiraling down to an altitude of 2,700 kilometers for the first series of scientific observations. 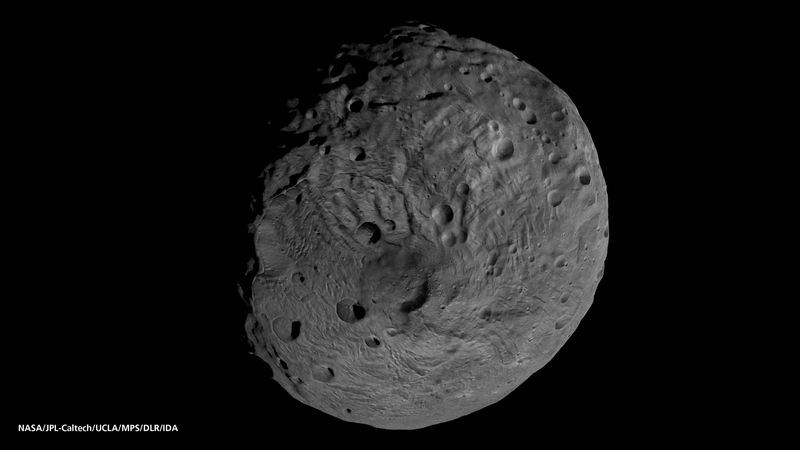 We have been calling Vesta the smallest terrestrial planet. The latest imagery provides much justification for our expectations. 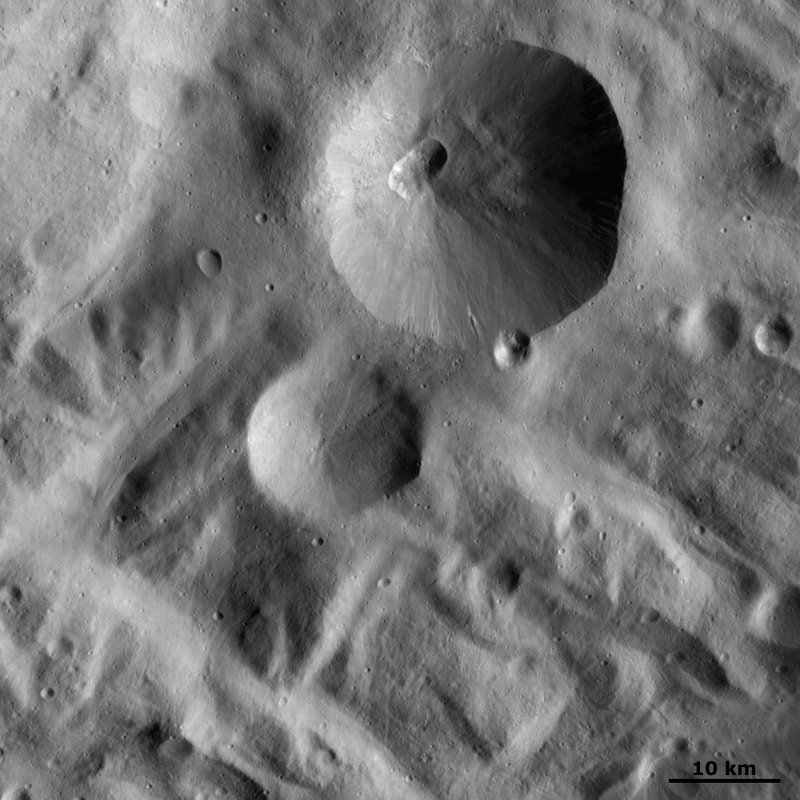 They show that a variety of processes were once at work on the surface of Vesta and provide extensive evidence for Vesta’s planetary aspirations. 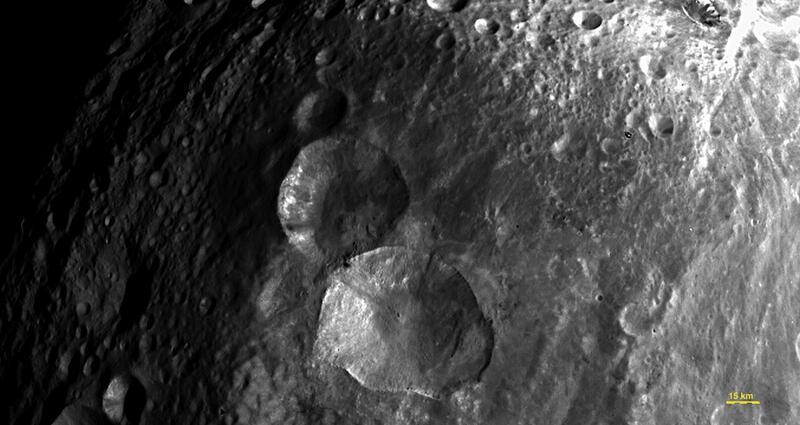 Below are additional images of Vesta from the 24 July collection. ED: Images from the press conference are here. Full Rotation of Vesta is here. 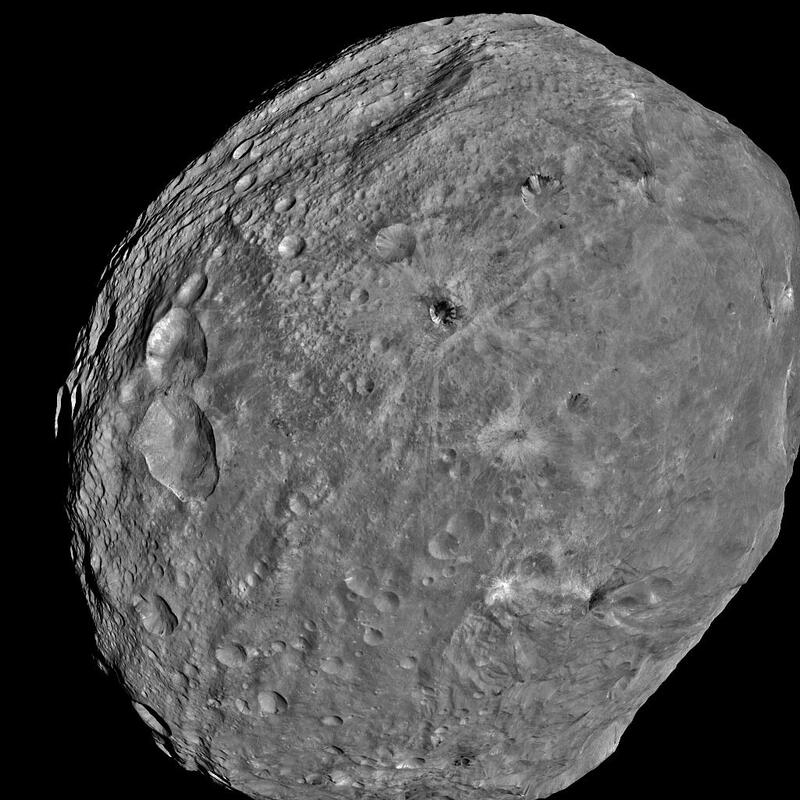 NASA will hold a news conference on Monday 1 August 2011 at 9:00 AM Phoenix time (Noon EDT) and release the first full frame images of Vesta from the framing camera. 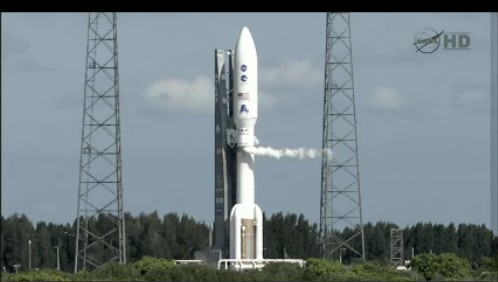 Both NASA Television and the JPL’s website will broadcast the event. It also will be carried live on Ustream. Visual and Infrared Imaging Spectrometer (VIR) – produces spectral images from 0.35 to 0.9 micron, 0.8 to 2.5 micron and 2.4 to 5.0 micron. 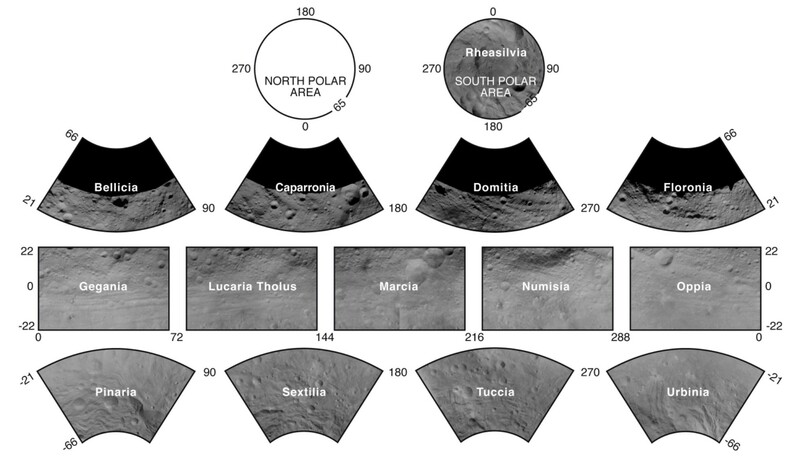 Gamma Ray and Neutron Spectrometer (GRaND) – Measures elemental abundances on the surface of Vesta and Ceres. Gravity Science – Utilizes the radio link used for communications and carefully observe the Doppler shift in the link’s carrier frequency. 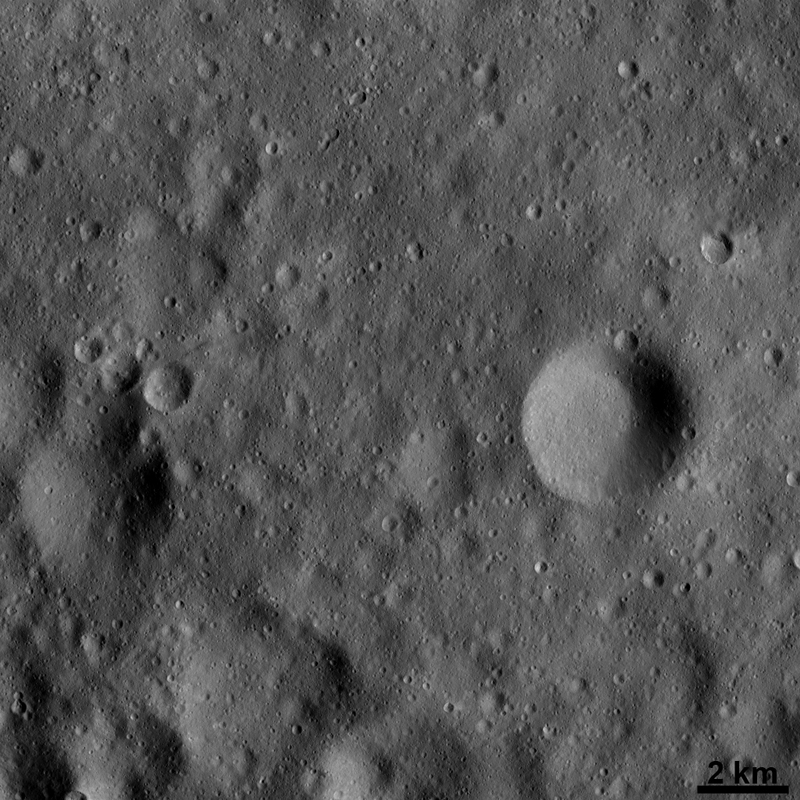 After spending one year orbiting Vesta, Dawn will travel to a second destination, the dwarf planet Ceres, and arrive there in February 2015. Is An Earth Trojan Asteroid the Logical Target for the “Flexible Path”? 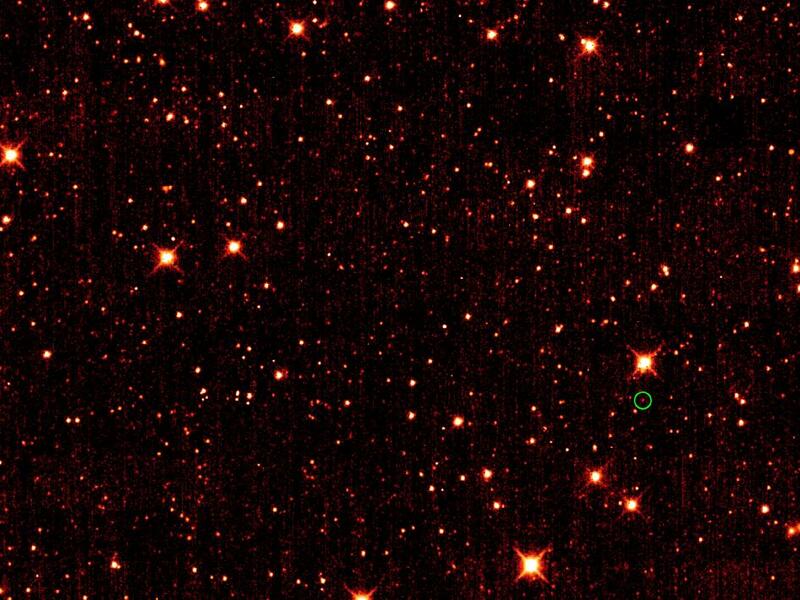 Asteroid 2010 TK7 is circled in green. Scientists using the Wide-field Infrared Survey Explorer (WISE) have discovered the first Trojan Asteroid in Earth orbit. Trojans orbit at a location in front of or behind a planet known as a Lagrange Point. A video of the asteroid and its orbit at the Lagrange point can be found here. Martin Connors of Athabasca University in Canada is the lead author of a new paper on the discovery in the July 28 issue of the journal Nature. These asteroids dwell mostly in the daylight, making them very hard to see. But we finally found one, because the object has an unusual orbit that takes it farther away from the sun than what is typical for Trojans. WISE was a game-changer, giving us a point of view difficult to have at Earth’s surface. TK7 is roughly 300 meters in diameter and traces a complex motion around SEL-4 (Sun Earth Lagrange point 4). The asteroid’s orbit is stable for at least the next 100 years and is currently about 80 million kilometers from the Earth. In that time, it is expected to come no closer that 24 million kilometers. 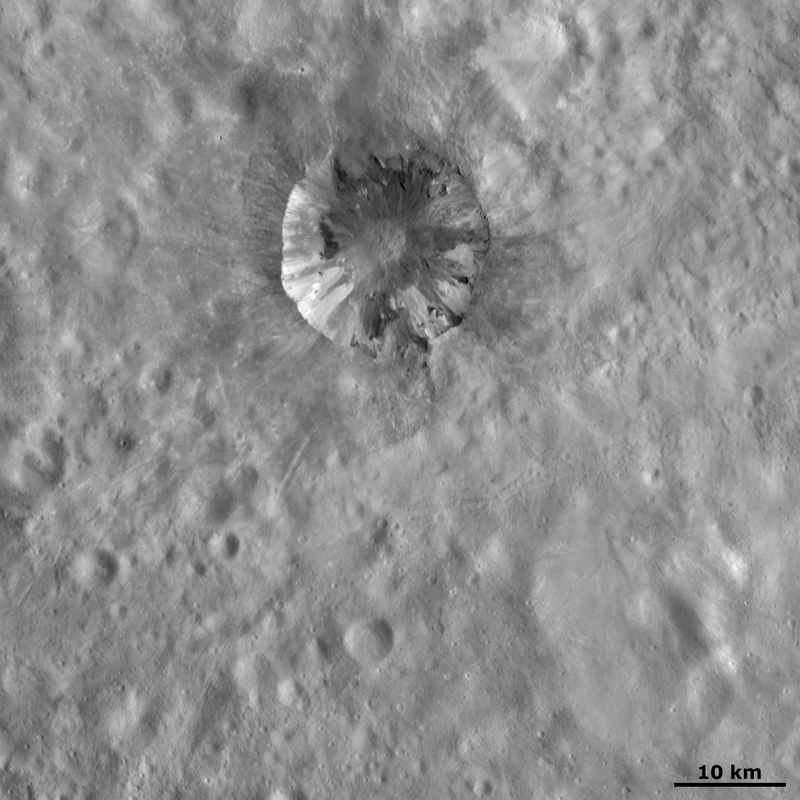 The obvious question is whether this is the logical destination for NASA’s Flexible Path manned asteroid mission? The Lagrange 4 point (SEL-4) is a logical way station on the Solar System exploration highway. Other NEO asteroids that have been identified as possible targets are few and much more difficult to reach and return than an asteroid at SEL-4. This may well be the target of opportunity that opens manned exploration of the Solar System in an “easy” mode. Unfortunately, Asteroid 2010 TK7 travels too far above and below the plane of Earth’s orbit, which would require large amounts of fuel to reach it. NEOWISE is the program for searching the WISE database for Near Earth Objects (NEO), as well as other asteroids in the Solar System.The NEOWISE project observed more than 155,000 asteroids in the main belt between Mars and Jupiter, and more than 500 NEOs, discovering 132 that were previously unknown.